7 bedroom, 4.5 bathroom villa in the Emerald Island Resort community. Owned by Caroline Taylor. Ref: 1888. *2 Kings both ensuite with new wood flooring , 2 Queens bedrooms , 3 Twins Bedrooms all with wall mounted cable tv for extra room. Downstairs the open plan living room the sofa can convert into a bed. 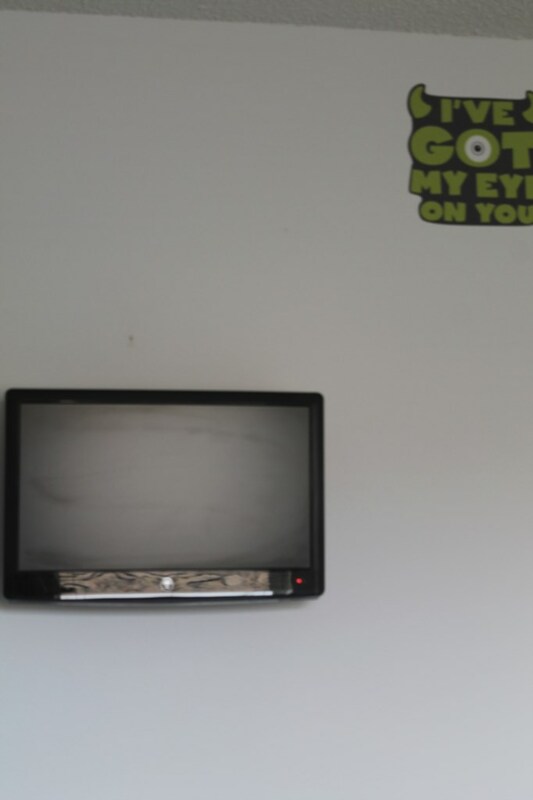 *TV in every bedroom, 48 Inch" HDTV + DVD , Playstation 2 and DVD player in Family Room; DVD's available for movie nights. 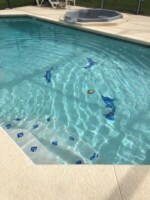 *14 by 30 Heated Pool with child safety fence and alarmed doors extended deck. BBQ available for hire $45 a week. This luxury villa has 3681 sq ft under roof (4881 sq ft including pool). With its corner location it is perfect for larger families and groups. It is just a 2.5 mile drive from the World Drive entrance to Walt Disney World. We will send you the short cut details to get on the I4. 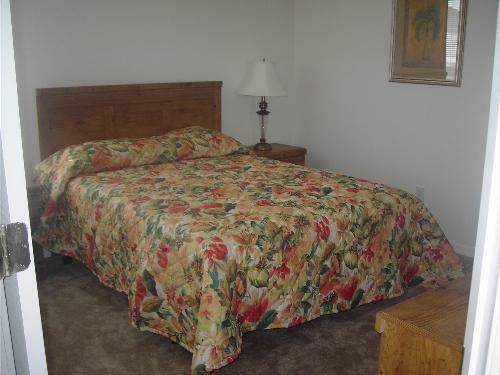 One of the Master Suites is on the ground floor, complete with a large bathroom, walk-in closet. 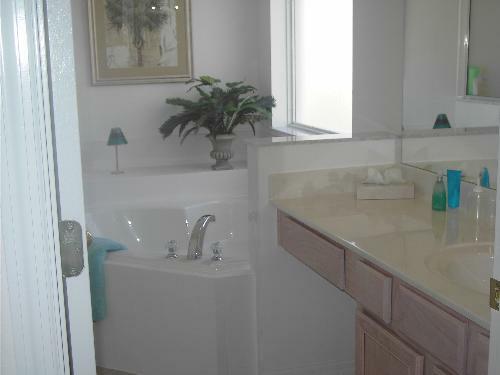 The other Master Suites is upstairs with en suite bath room and wlak in closet. 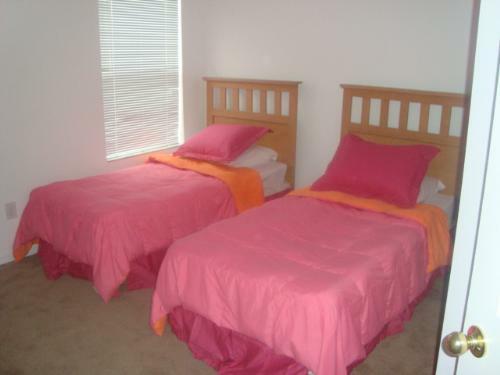 The other 5 bedrooms are upstairs where they share two 'Jack and Jill' style bathrooms. 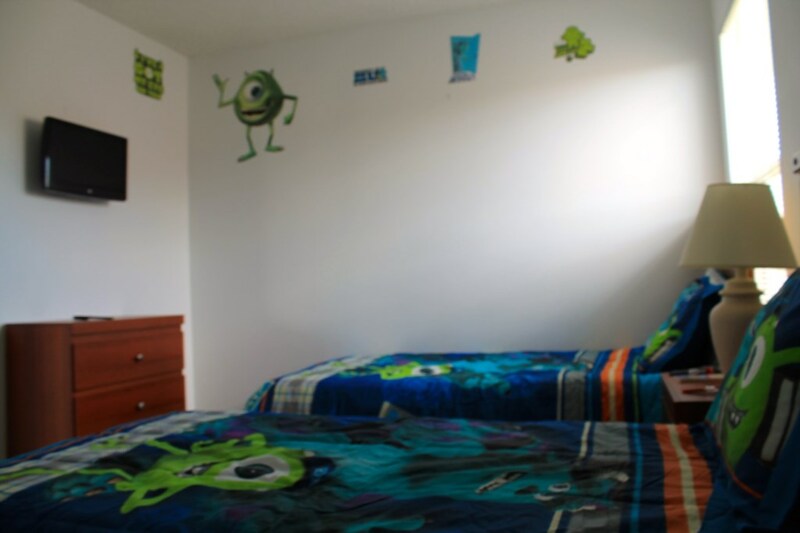 Each bedroom has its own TV with access to the cable channels. There are HD boxes in the living room and in the downstairs master giving you access to additional channels. There is plenty of room for the whole family to eat either outside (10 seatings outside) by the pool or in the two dining areas inside the Villa (14 dining seatings in total). We have a large deck to 30' x 40'. Fully screened, and containing a large heated 30' x 14' pool with a gas BBQ available for hire and a heated seven seater luxury spa, there is plenty of room for everyone to relax outside. Our home is in the stunnning Emerald Island Resort which is a gated community that is almost completely surrounded by wetlands and a nature preserve to provide a relaxing setting for your vacation home. 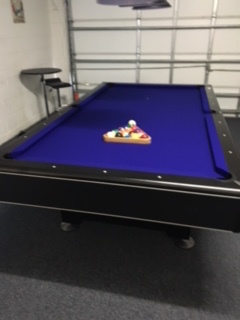 Our 4,100 square foot Clubhouse has a large gathering room with fireplace and big screen TV, an exercise room, sauna, Cyber café, game arcade, large Wii machines. 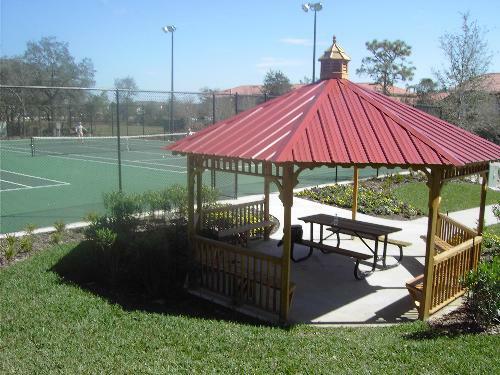 Outside the beautiful Clubhouse is a heated pool, Tiki Bar for refreshments and a hot tub as well as a tennis courts with outside gazebo and BBQ area , kids play area and sand volleyball court. 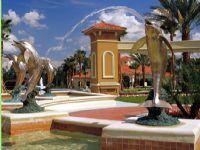 The walking trails start next to the beautiful entry fountain with it’s leaping dolphin statues. This luxury villa with a private pool on a huge deck, this is one of best value and most luxurios rental properties available in Emerald Island Resort and is the perfect place for larger families and groups. It is just a 2.5 mile drive from the World Drive entrance to Walt Disney World. This house is fantastic value and will guarantee a great holiday. It comfortably sleeps 14 but can sleep up to 16 people and has all of the added extras that you would wish. The house is alarmed for your added security and is on the corner so very roomy and only partially overlooked. 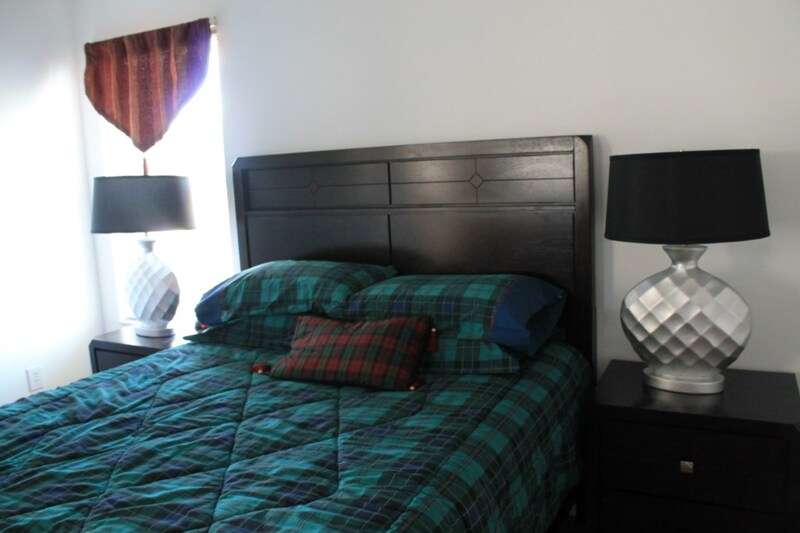 One of the Master Suites is on the ground floor, complete with a large bathroom, walk-in closet. The other Master Suites is upstairs. 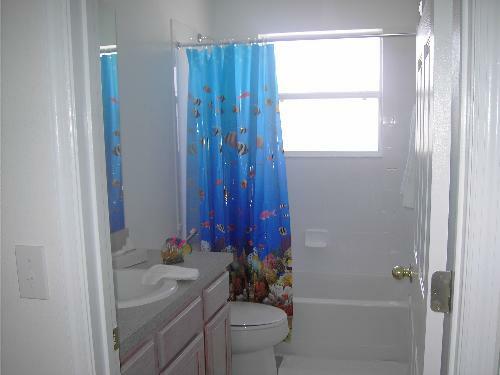 The other 5 bedrooms are upstairs where they share two 'Jack and Jill' style bathrooms. No long waits for the bathroom in this Villa! There is plenty of room for the whole family to eat either outside (12 seatings outside) by the pool or in the two dining areas inside the Villa. We have dramatically extended the south facing deck to 30' x 40'. 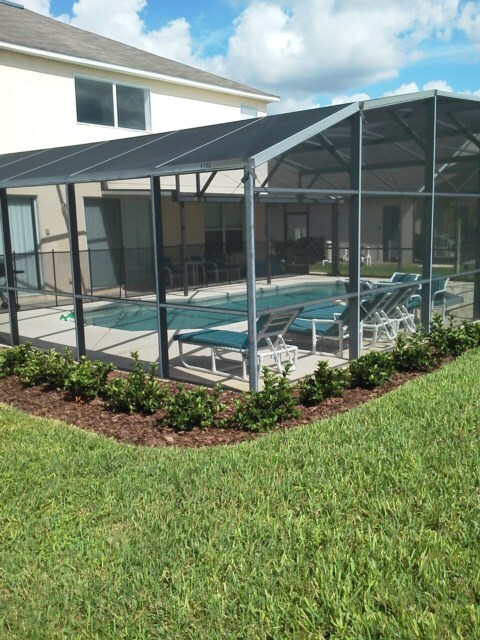 Fully screened, and containing a large heated 30' x 14' pool with an inground spa, there is plenty of room for everyone to relax outside. 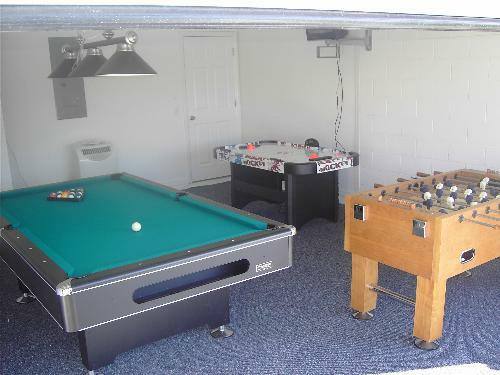 The games room includes pool table , basketball machine, foosball , stereo system,and TV. 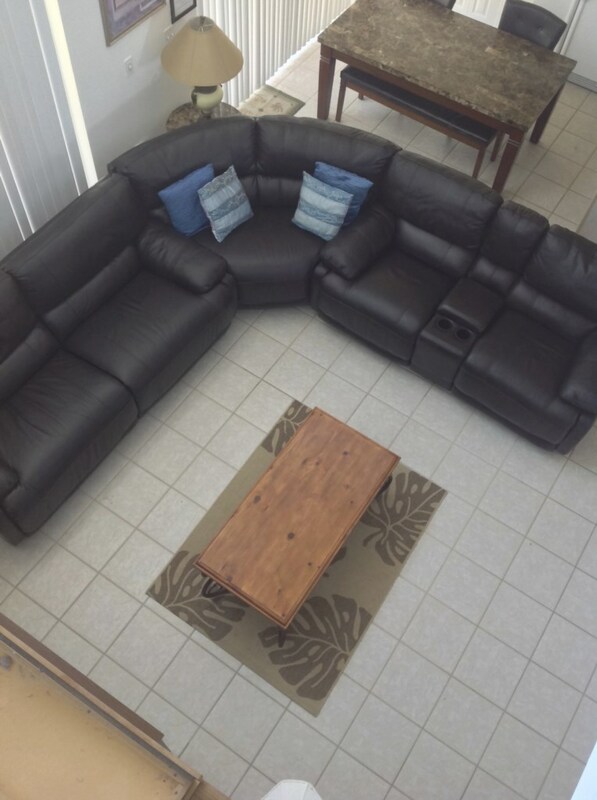 The family room has a 48 inch TV , DVD ,Prism TV record box with a large black leather sectional sofa and ottoman and a large ceiling fan. 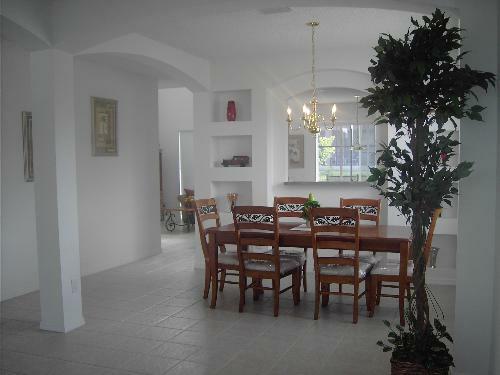 There is a second quieter sitting room and a dining area. On arrival you will go straight to my home and arrive to find an 11 item food pack waiting for you. 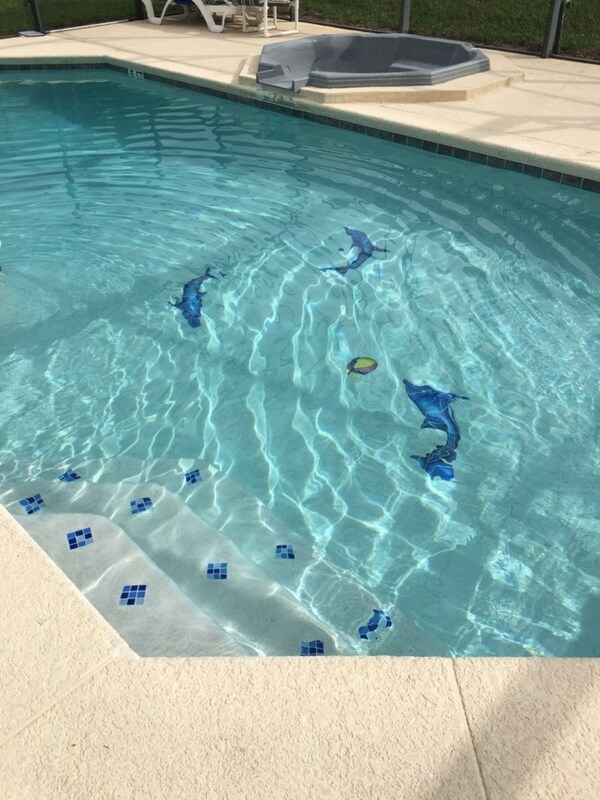 There are extras like pool towels available for your use to save you having to pack them. Hairdryers in every bathroom , and hair straighteners in the master. There is an Ipod docking station so you can charge your Ipod and listen to your own music. 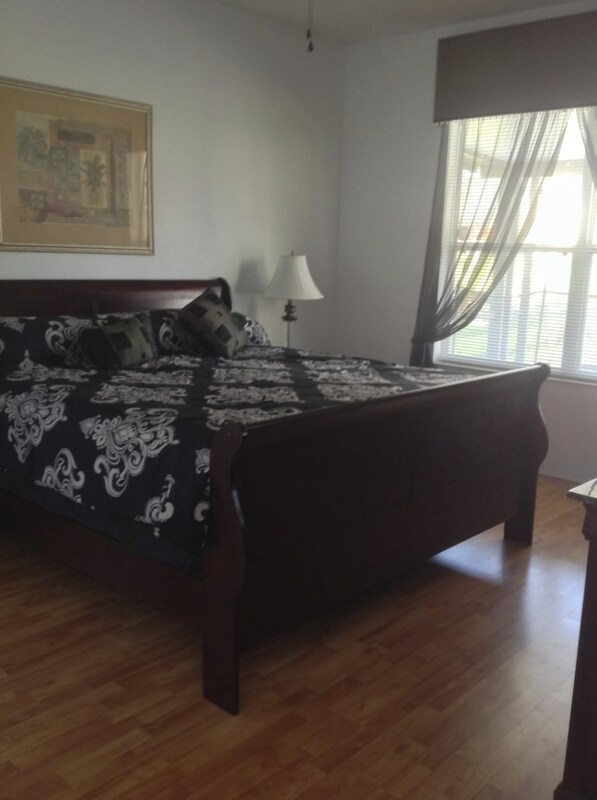 Low season prices from $1280.00 / £800.00 per week. Peak season prices from $1600.00 / £1000.00 per week. 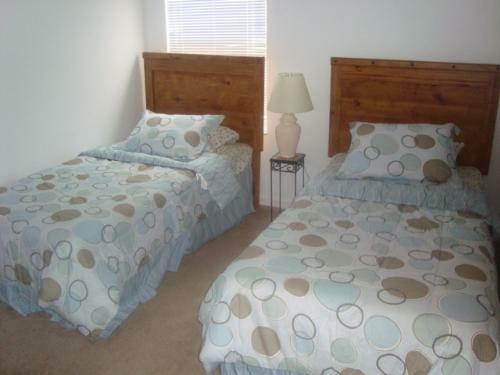 Stays of Less than a week incur a $130 cleaning fee. 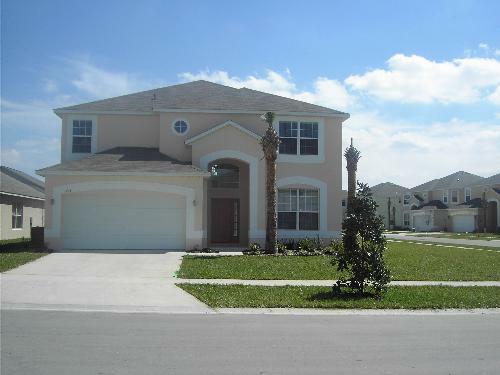 Emerald Island is a fabulous location so close to Disney, This villa is situated in a secured gated community within easy access to all parks, shops, restaurants and amenities. 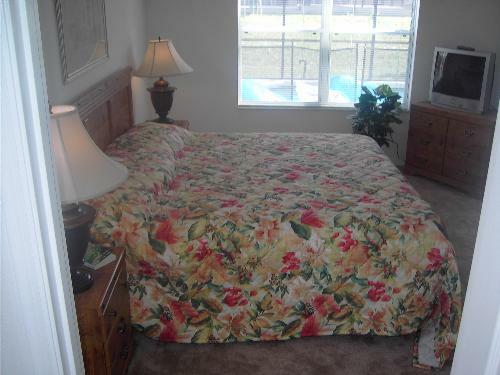 The property has seen an upgrading to all bedrooms, bathrooms and the pool area is one of the best I have stayed in. Fabulous value for money, look forward to our next stay. Your enquiry will be sent to villa ref 1888 only. This page has been viewed 20280 times since 10 Jan 2005.